A set of beautiful windows improves the curb appeal of your house. Well-constructed and perfectly installed windows deliver maximum comfort and peace of mind as you lounge around your home. When replacing windows in St. Louis, you should look for three essential elements: material, construction, and installation. Considering these factors will help you find the best product for your home. For your windowpanes and frames, choose products made from durable materials that help improve the insulation of your home. At Renewal by Andersen®, we use Fibrex® for window frames. This material offers the low-maintenance features of vinyl and classic look of wood. Fibrex frames will never require repainting. For your windowpanes, we use High-Performance™ Low-E4® SmartSun™ glass that carries an ENERGY STAR seal of approval. Products with this prestigious label are designed to lessen energy consumption, helping you save money on utility bills. The construction of the window is important to make sure that its parts – from the frames and panes to the sashes and other parts – are working properly and can withst and extreme weather conditions. With well-constructed windows, you won’t have to worry about the elements, such as strong winds, cold temperature, and the blazing heat of the sun. Unlike other products, our window frames are created to last longer and perform better with minimal maintenance. Compared to vinyl, wood, and aluminum windows, Fibrex windows can insulate your home without exp anding or contracting to the point of creating air gaps or breaking the glass. Furthermore, our weather tight seals will remain weather tight all year round. This means, you’ll never have to worry about drafts and leaks. Our window frames will remain rigid and stable in any type of climate. In addition, they will not rot, corrode, pit, or crack, making our windows a smart choice for your home. Excellent construction equates to superior performance. At Renewal by Andersen, we don’t just offer state-of-the-art glass for windows. We provide a complete package that meets your needs in any weather condition. To enjoy the full benefits of your replacement windows, you should only let well-trained and experienced professionals install them. Renewal by Andersen of St. Louis has replaced many windows. You can count on us to do the job right with a respectful approach you would expect from an industry leader. We also offer comprehensive warranties for our installation and replacement projects. 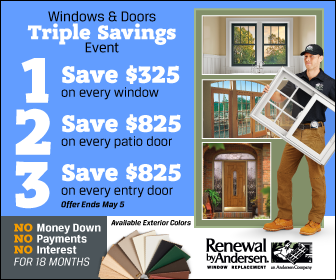 You can count on Renewal by Andersen of St. Louis to help you choose high quality replacement windows. As a fully certified retailer, our team offers a range of stylish and energy-efficient windows from Renewal by Andersen. All products we offer are backed by the company’s unparalleled 20/2/10 limited warranty. From innovative materials and quality construction to excellent installation, we assure you that our team will meet your needs. Call us now for your St. Louis MO home remodeling jobs.